There are thousands of airports all over the world and countless planes in the skies each and every day, taking legions of passengers all around the globe. Air travel has connected people and locations in so many ways, making it easier than ever to get around and visit new places. The next time you book a flight, you may notice that the airports you’re traveling to and from all have their own unique three letter codes. This is known as an IATA airport code and is used to identify each airport. For Denver, the airport code is DEN, which is the code for Denver International Airport. What is the Denver Airport Code? There are multiple airports to be found all around the Centennial State, and for the capital city of Colorado, Denver, the main airport is Denver International Airport. Denver International Airport has the airport code DEN and is located just east of the downtown districts of the city of Denver. The address for airport code DEN (Denver International Airport) is 8500 Peña Blvd, Denver, CO 80249. A contact phone number for this airport is 303 342 2000, and the airport can also be contacted via 800 247 2336 or texted via 720 370 9002. The lines are open from 6.30am to 10.30pm each day, with friendly staff ready and waiting to take your calls and answer your questions. Denver International Airport was not always the major airport for the city of Denver. The city was once served primarily by Stapleton International Airport, which operated in the area from 1929 through to 1995. Denver has always been one of the biggest and most important cities in the United States, so has always needed a large airport. Over time, however, it became clear that Stapleton International Airport did not have the sufficient facilities or size to cope with modern demands and traffic. The gate space at Stapleton was very small compared to other major airports of the time, and the runways weren't properly laid out to cope with Denver's somewhat unpredictable weather, leading to delays and other problems for both passengers and pilots. In the 1980s, plans started to be put in place for the construction of a new airport, with various areas being investigated as possible locations. It was in 1989 that the project officially began, but delays and other issues meant that construction was relatively slow. DEN airport was set to open in 1993, but that date eventually got pushed all the way back to 1995, with the airport finally replacing Stapleton on February 28 of that year. 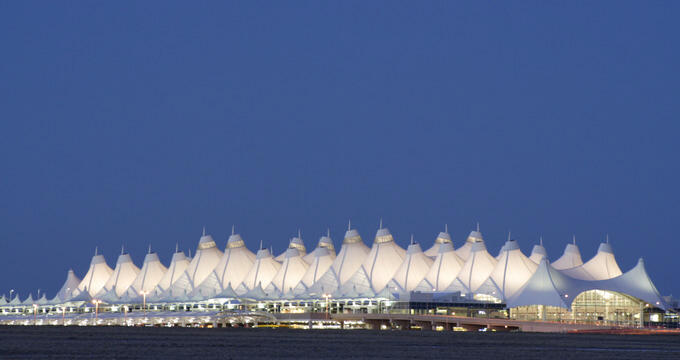 DEN had actually been the airport code for Stapleton, but since Stapleton was closing down as Denver International opened up, Denver International was able to take its IATA airport code. The airport cost nearly $5 billion to make but has gone on to lead the way in American airports as the largest and one of the busiest. Airport code DEN, Denver International Airport, is the largest airport in the entire United States in terms of surface area, with the airport covering an astonishing total of 33,531 acres of land. It also has the distinction of having the longest runway in the United States: Runway 16R/34L is 16,000 feet long. DEN airport has the second busiest network of any American airport and typically ranks as the 20th busiest airport in the world and the fifth busiest in the United States. DEN has over 60 million passengers passing through each and every year. It is a hub for both United Airlines and Frontier Airlines, as well as being a focus city for Southwest Airlines. Many other airlines operate in and out of DEN airport, with the airport serving over 180 destinations in the United States alone and many others all around the world. The top domestic destinations for DEN airport are Los Angeles, CA; Phoenix, AZ; Chicago, IL; Las Vegas, NV; and San Francisco, CA. The top international destinations for Denver International Airport are Cancun, Mexico; Vancouver, Canada; Toronto, Canada; Frankfurt, Germany; and London, United Kingdom. There are multiple options for parking at Denver International Airport, so there'll definitely be a lot or garage to suit your budget and needs. The parking garages are just 5-10 minutes from the terminal building and cost $25 per day, while the economy lots are 10-12 minutes away by foot and cost only $16 per day, with that rate dropping to $15 after three days. The cheapest option for parking at DEN airport is the shuttle lots, Pikes Peak and Mt Elbert, which charge just $8 a day and are served by free shuttles to take you over to the terminal. There are plenty of options for people traveling to and from Denver International Airport. If you want to get to DEN airport by car, you can simply follow the major highways and signs to reach the airport with ease, leaving your car in one of the lots or garages. If you prefer to rely on public transportation to DEN airport, you can choose between buses and rail. There are three bus routes running from Denver, Aurora, and Boulder to the airport, with other buses also available even across the border into Wyoming. The airport also has its own train station which is connected to Denver Union Station, letting passengers access the airport from Downtown Denver in around half an hour. Getting around Denver International Airport is very easy. It's a big airport but it's smartly laid-out. Depending on where you park your car, you can get on shuttle buses or use pedestrian walkways to reach the main terminal building: Jeppesen Terminal. The terminal is split into West and East sections which are clearly marked, and there are three concourses, A, B, and C. Getting between these concourses is easy via the use of bridges and walkways, with several moving walkways offering speedier travel around the airport. DEN airport actually has its own on-site hotel in the DEN Hotel and Center, which is just a short walk from the Jeppesen Terminal and is actually the same building that houses the Denver Airport train station. This hotel is The Westin Denver International Airport and its address is 8300 Peña Blvd, Denver, CO 80249. The airport can be contacted via 303 317 1800 and features sleek, stylish rooms, some of which offer views of the Rocky Mountains. The airport is fitted with a range of rooms, as well as a restaurant, cafe, bar, gym, and indoor pool. There are several other good hotels within close proximity to Denver International Airport, with many of these hotels providing complimentary shuttles to and from the terminal building. Read on for contact details of the best hotels near DEN airport.